(CelebrityAccess News Service) – C'MON America 2003, the newly released Sheryl Crow concert film DVD, will be presented on the big screen January 13 at 7:30 p.m. in an exclusive screening at select Regal Entertainment Group theatres across the country. The One Night Only big screen premiere presented in REG theatres follows the recent DVD release of C'MON America 2003 (Universal) and the recent CD release of The Very Best of Sheryl Crow (Interscope Records). The special concert event presented by Regal CineMedia entertainment services, AEG TV, AEG LIVE, and Interscope Records will take place in REG theatres in 25 cities, including New York, Los Angeles, Boston, Las Vegas, Philadelphia, San Francisco, and Washington, D.C., among others. Advance tickets are available through January 12 at event location box offices and at www.RegalCM.com for $10.00. Event day tickets will be available at event location box offices and online for $12.50. Directed by Martyn Atkins (ALL ACCESS: Front Row. Backstage. Live! 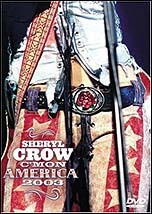 ), Sheryl Crow's C'MON America 2003 concert DVD captures the rock artist's 2003 concert in Kettering, OH. The concert includes popular songs from Crow's 2002 CD C'MON C'MON ("Steve McQueen," "Soak Up the Sun," "C'mon, C'mon"), as well as hits from earlier albums such as "If It Makes You Happy," "Leaving Las Vegas," and "All I Wanna Do." In addition, the concert features Crow's cover of the "The First Cut Is the Deepest" from her latest CD The Very Best of Sheryl Crow.